Easy: Focus on testing, not the tool. Test history: Always know the results of past tests. Test in teams: Share lists and results. 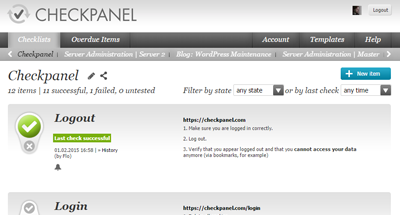 Checkpanel's interface is beautiful, uncluttered and fun to use. Organize your test cases in simple lists. Done testing? Report your results with a single click of the satisfyingly big buttons. Each case can have as little or much information as you like. Want to keep it lean? Just add a title for each case. Want to provide your team lots of details? Go nuts in the description, add formatted instructions including images and screenshots. 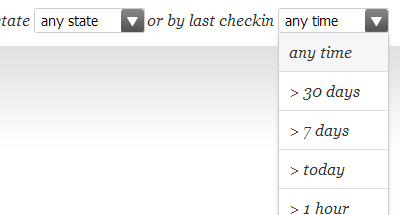 See for every regression test case when it was last checked. When something breaks or otherwise fails, you can look up when it was last tested and think about what was changed since then. 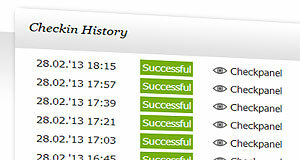 You can also go further back in history and see all past checks, who did them and which failures occurred. You can easily spot patterns, for example if something breaks for similar reasons again and again. The last thing you want to worry about while regression testing is worrying how to document your results. Checkpanel makes reporting results real easy. You can format your reports to give them structure and you can paste screen shots. This gives you a better overview about what is wrong right now and also serves as a useful reference for future regression tests. 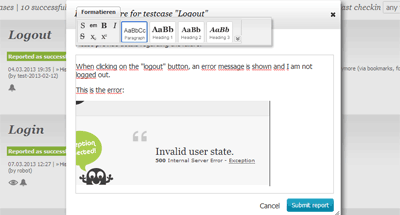 Make sure that your regression test actually gets done. Set reminders to execute tests frequently. 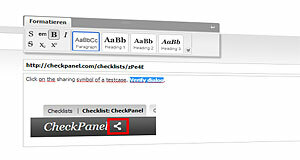 Checkpanel will highlight which tests are due for a check. They will be marked in each list, on the main index as well as a separate digest view. Optionally receive a daily email digest of tests which are soon due to be tested. 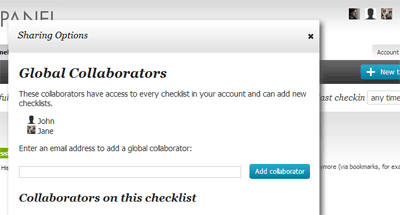 Filter your tasks depending on the state or the time when it was last checked. For example, only show items that have not yet been checked today. Or show only the items which have been reported as failed. During final regression testing for a new feature, you can simply filter by tasks which have not been tested today/this hour. The list will be updated with each test, so you can just run through your checks until the list is cleared. Share lists with your team. Receive notifications about defects reported by other team mates. 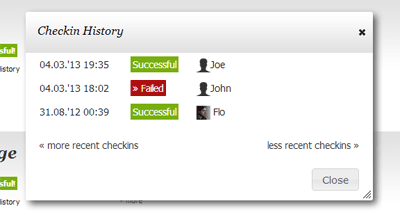 Test results and other changes will be synched in real time across team members. You can even edit the same lists simultaneously. Plenty more features are waiting to make regression testing more fun. Read more, or just sign up for free and give it a try! A regression test is focused on finding defects in product during its continued development. Regression tests are meant to be repeated frequently. Typically a regression test run will be started after the code has been modified, patches have been applied or the system configuration has changed. The term regression testing is primarily used in the context of software testing. The term is less common in other industries like automotive or energy although, obviously, regression tests will be performed outside the software world as well as part of quality assurance processes. Specialized tools like Checkpanel help managing regression tests. They focus on continuity rather than one-off tests. Test results get logged and can be accessed at a later time for future reference. While some tools focus on complex testing processes and test plans, Checkpanel enables uncomplicated test case creation and result reporting. Another category of regression testing tools focuses on automated tests. They are typically targeted towards developers and provide testing frameworks in which automated tests can be programmed and managed. 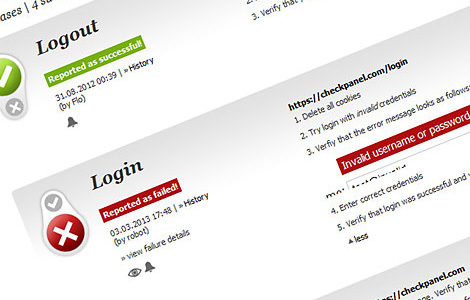 Although Checkpanel offers automated checks of web pages and services, its main focus is on manual regression testing. Manual tests can be quickly set up by any testing team member, especially with a user friendly tool like Checkpanel. One advantage of manual regression tests is that testers can notice issues which are not strictly specified in the test case. While an automated test would succeed as long as exactly the specified criteria are met, a human tester can notice things that "seem off". Manual testers can notice inconsistencies or possible improvements during testing and can quickly adjust test cases to improve the coverage.